A few weeks ago, two of my dear cousins came to town for a visit and stayed at my grandmother's house. On their last day, we sat together in my grandmother's bedroom on her boldly upholstered sofa, knitting, looking at old scrapbooks, reminiscing, and assessing the future. One of my favorite things in my grandmother's bedroom, aside from that great sofa, are the throw pillows that cover it. I've said it before but one of the things I love about my grandmother's house is that her handiwork is everywhere. And those pillows are no exception. Some were gifts, some made by her children and many made by her. To me, they are little gestures that carry so much love, care and effort. And during the time we spent in her bedroom that Sunday afternoon, I determined that I would make each of the girls a pillow of their own for Valentine's Day this year. When I was living on my grandmother's farm, she gifted me a small basket of her fabric scraps and many of those fabrics went into the girls' pillows. At the bottom of that basket, I also found a piece of the same fabric that upholsters her bedroom sofa–enough to back each of the girls pillows. 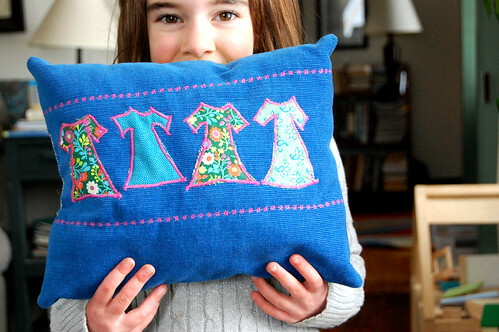 As I ironed and stitched the fabrics together and appliqued a special design on the front of each pillow, for each girl, I said to my husband, "This fabric smells like her still." It made me teary, but happy. And when those three little girls opened their presents Valentine's morning and pulled out the pillows, they clutched them and buried their noses in them. "This smells like Meemu!" And they recognized that fabric and knew bits of it were from her. It made all the effort and the sneaking-around sewing, and the borrowed sewing machine, and the stuck fingers, and the ripped out stitches and silly mistakes worth it. you are a sweet heart, a wonderful mother, and good granddaughter. What a wonderful way to honor her memory. oh, m. thank you. xo. Oh my goodness. I’m crying over here. Scent is such a powerful thing. I can’t help but think that the very best gift you’ve already given… spending time with her while she was still alive. There are so many who just don’t. And the tangible reminders just can’t make up the difference. Love it..and you can tell by their eyes that they do too! 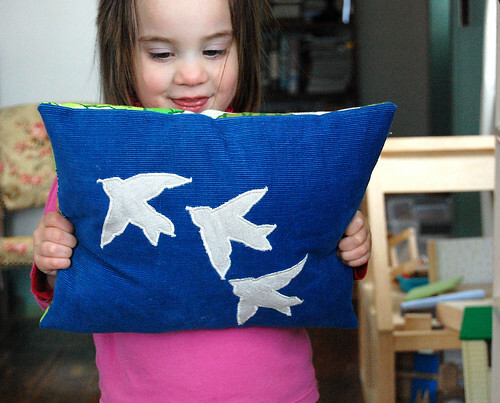 What a great way to use the fabric that she gave you, and how touching that they realized it had belonged to her. Treasures, all. So wonderful. I love that they know the smell. You are one sweet mama. I love how fabric can smell of our loved ones in that sweet and special way. This is so lovely Molly and thank you for sharing it with us. 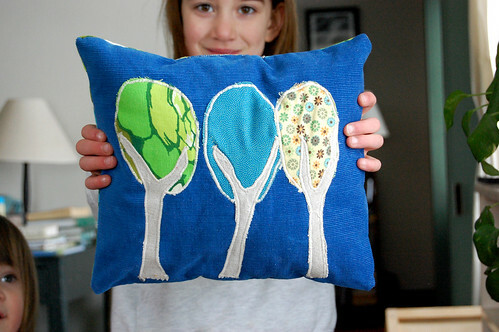 What a wonderful way to use those scraps. This makes me so happy. Love. Beautiful story, beautiful girls, and beautiful handiwork. Nicely done! Beautiful words. I miss my grandfather everyday. I have some of handkerchiefs, and they’re scent take me back to being young and close to him. What a wonderful way to preserve her memory, for each one of the girls. what a sweet story! i love that you are caring on the traditions of your grandmother. sweet. what a good mama you are. your daughters are blessed. I love that you’ve made the memories of her so real by adding the tactile to it. The pillows are beautiful, as are your girls. I’m sure your grandma is proud. these are so sweet. and the sentiment behind them so nice. Nine years after my Nana (grandma) passed away, if the wind’s just right and the air sort of sunny, I can still smell her scent in the Shaker Pie Cupboard and old wooden dresser she left me. That smell, it’s everything, somehow. I’d nearly forgotten until I read this, and the shivers are still running down my spine. Thanks for the reminder. And what goodness you captured to pass on to your girls! 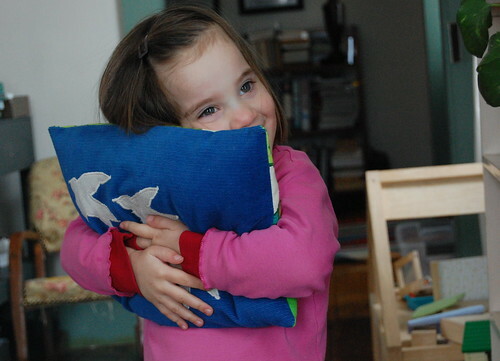 Just wonderful… that photo of your girl clutching her pillow in a hug is just so sweet and fantastic. Good Mama! the pillows are wonderful, what a great gesture and handing-down of love. i still have some fabric from my granny’s sewing room i keep in a sealable bag to retain the smell. how precious…it’s funny how much more I miss my Grandma now than I did when she passed away. So thankful for the sweet memories. Wonderful. What a gift that your girls knew her and recognized her in the pillows. What a gift you are to your daughters. Beautiful post. What a wonderful way to pass an heirloom, really… How very special. You’ve given your girls (and I think yourself, in a way) a wonderful gift. Aww what woderful gifts! I got tears in my eyes! The girls will cherish them forever! I’ve been wishing I could find a way to connect my future child’s great-grandmother to him/her in some tactile way. Now I know- you’ve inspired me to take an old apron of my grandmother’s that I probably won’t ever wear but couldn’t bear to part with and use it to make pillows (or patches on pillows so if I have more than one child they can all have a connection). And it’s so true certain scents linger forever-they are so powerful! Beautiful idea! That is so lovely. Thank you for sharing this. I love the smell on old fabric that belonged to family or friends. I have two boxes of my grandmother’s dresses waiting for me to do something so loving with them. Everytime I open them, I catch her scent in the air. I love your idea and it gives me hope that one day I will be able to do something as wonderful!